I had to force myself to finish this book, which is sad. I was excited about it--it got good reviews, and HEY! it's by Chris Elliott. Which is, of course, a double-edged sword. I don't think this book would have been published if it hadn't been written by a celebrity. I'm not putting it into the 'Bad Books' category because I'm not sure if I'm being very objective. I don't go in much for the madcap-wacky-hijinks-look-at-how-funny-I-am sort of books. I (usually) find them obnoxious. This particular book actually irritated me more than Terry Pratchett generally does. And that's saying something. By page nine, there had been a multitude of jokes about farting, phlegm, vomit and masturbation. If this sounds like your thing, you'll be happen to know that as the story progresses, there are also guffaw-inducing (yet subtly witty) references to genital piercing and erectile dysfunction, midgets and even more masturbation. Even the self-deprecation got old. He does get points for having a heroine from Maine (Hey, I was totally up-front about not being objective, so I figured I'd really go for it. ), as well as for the snarky asides to the reader. There was also a one-liner about Walter Sickert that made me laugh. The identity of the villain was actually--well, just awesome. I was almost glad that I had stuck with the book just because of that one bit. Almost. Heck. 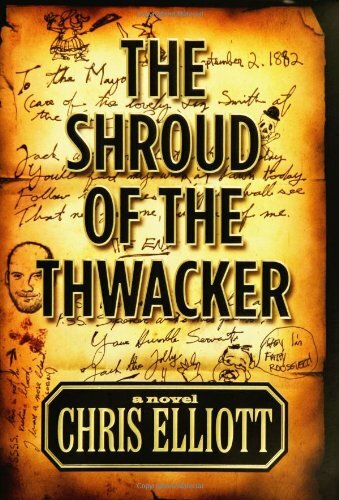 If you like Terry Pratchett and that Jasper Fforde book that I didn't like, you might like The Shroud of the Thwacker. You might NOT feel like Chris Elliott was thwacking you over the head with a bag of apples.